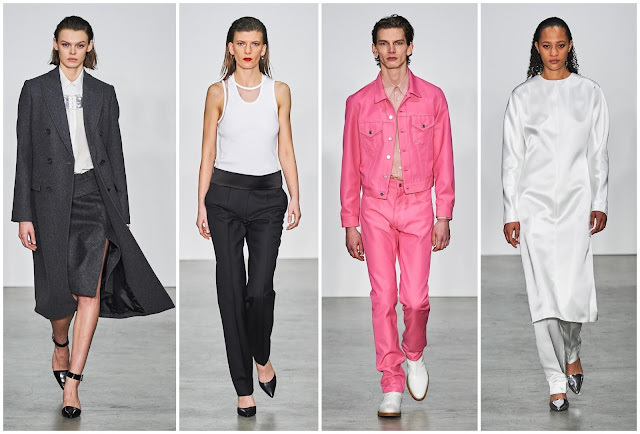 On Monday night, the second iteration of the Helmut Lang revival was unveiled. In 2018, Alix Browne, founding editor of V magazine, was appointed editor-in-residence, replacing Isabella Burley. Under her purview, she tapped Mark Howard Thomas and Thomas Cawson to envision Helmut Lang for 2019. Thomas will look after the men’s and women’s collections while Cawson will be responsible for Helmut Lang Jeans. Thomas’ pedigree includes stints at Joseph, Givenchy, and Neil Barrett; Cawson served as global creative director of Calvin Klein Jeans during the Raf Simons era. He restored minimalist rigour to the brand, in all its 1990s glory. It was truer to the original than Shayne Oliver’s attempt for Spring 2018, the brand’s first attempt at revitalising the label in the latter half of the 2010s. Focusing on a 1970 Joseph Buey’s sculpture called, Felt Suit, a two-piece suit, Cawson’s narrative was about purity, minimalism, and constructing a new wardrobe. Those were the beliefs synonymous with Mr. Lang himself. For the modern era, Cawson envisioned power dressing—tapered trousers, sharp-shouldered jackets, and the slew of leather looks added an urban sensibility. He called on the androgynous tropes of the house with men and women in matching tweed boiler suits, leather trousers, and coordinating crimson tailoring. Thomas delivered double denim in bubblegum pink, There was something entirely refreshing about this homage to the 1990s. It’s good to have Helmut Lang back, even if the namesake founder isn’t at its helm. Jack McCollough and Lazaro Hernandez at Proenza Schouler have borrowed a thing or two from the original Helmut Lang. For one, they have the same inclination to subvert simplicity, attempting to elevate the banal while maintaining a detached yet sensual cool. Moreover, their preferred show venues—anonymous, incomplete spaces—attracted Lang too. Experimentalists at heart, their creative streak has often made them scatterbrained—especially in recent years when a short-lived jaunt to Paris for two seasons threw a spanner in the works. 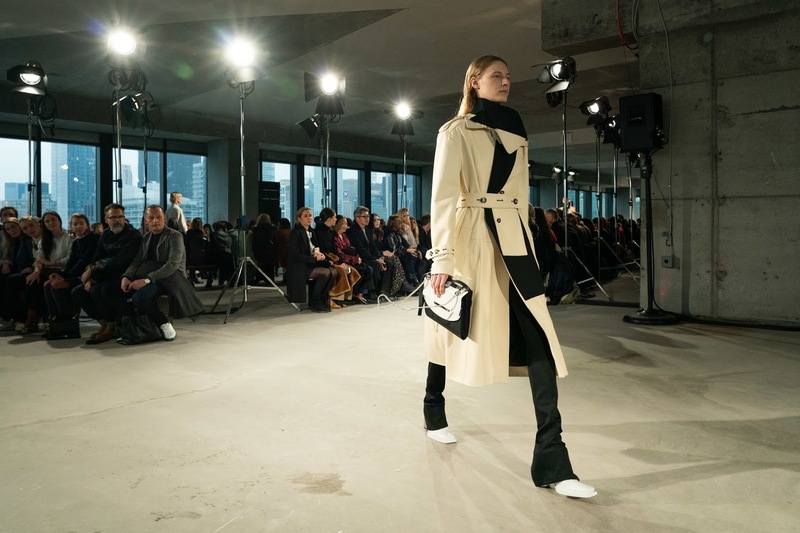 However, for fall 2019, they built on their musings on workwear staples in oversized, boxy silhouettes, full of asymmetric twists and turns. They carried forward the distressed denim look—applying it a beige trench coat, covetable fabric alchemy. Consistency paid off. Their clothes were convincing, if not a little too reminiscent of some European labels. Gabriela Hearst is 12 collections in and she’s nicely developing her minimalist aesthetic with warm and romantic tactile touches. 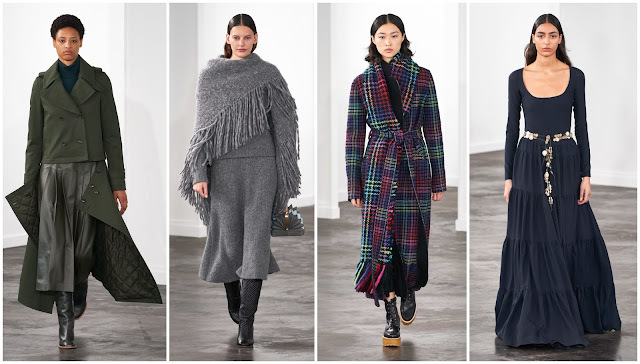 At her Tuesday morning presentation, she proposed colourful tweed, quilted jackets and skirts in neutral shades of olive and beige, double-breasted suits in slate grey and charcoal, fringed shawls, and subtle, unstructured dresses suitable for lounging or entertaining. It’s the fashion equivalent of comfort food. The story of New York Fashion Week has not really been what’s on the runways, rather what’s missing. Firstly, there are those tentpole names that have decamped the schedule for another city or schedule or altogether—Thom Browne, Altuzarra have gone to Paris; Rodarte showed in Los Angeles; Alexander Wang presents in June and December; Shayne Oliver’s Hood by Air is no more. Secondly, many have argued that New York is bereft of serious talent. I wouldn’t fret too much about New York’s voicelessness. Talent is alive: look no further than Telfar Clemens, Becca McCharen-Tran at Chromat, Kerby Raymond’s Pyer Moss (a no-show this season), and the duo at Eckhaus Latta. These guys have big ideas about class, race, and gender—the touchstones of American society—but are still working out how to translate those to the runway. Enter Thomas and Cawson at Helmut Lang. “We’re tired of meme fashion,” they told British Vogue. It’s about time the crux of fashion went back to the idea of creation. There aren’t many new ideas around anymore but passion still exists and it counts for something. Heck, throw Gabriela Hearst and the Proenza boys into the mix and you’ve got yourself a fashion week with competent designers with a passion for invention and reinvention, All things said and done, even if the schedule could be trimmed by at least five days, New York Fashion Week isn’t dead yet.